Around 200 exhibitors will showcase their technology solutions at the tech show. 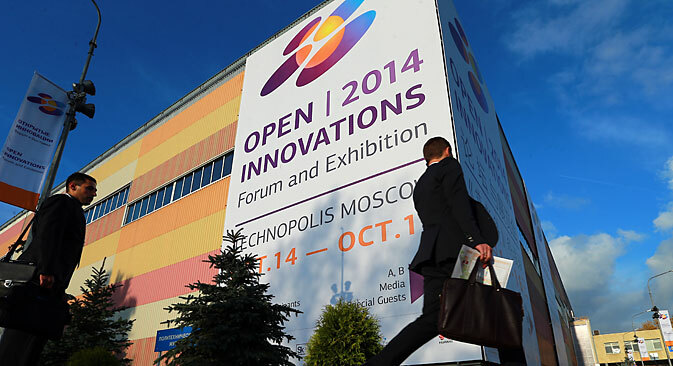 The 2015 Open Innovations Forum in Moscow is to be dedicated to exploring man's relationship to technology in the modern world. The main theme of the event, being held in Moscow for the fourth time, will be “Humanity in the Center of the Technological Revolution.” Each of the five days of the event will be dedicated to one area of life that is changing under the influence of the technological revolution – productivity, habitat, education, health and entertainment. Traditionally, this Russian government-organized forum, is the country's main event in the field of technological entrepreneurship and innovation development. This year's forum will include a five-day international congress as well as a tech show for a broad audience. This year's event is to be held in Moscow at VDNH, one of the largest exhibitions complexes in the world, from Oct. 28 to Nov. 1. Open Innovations 2015 will be an open-collar forum, focusing on lively, interactive formats – public interviews, debates, presentations, lectures, master classes, workshops and pitches. Around 200 exhibitors – from major global corporations to young start-ups – will showcase their technology solutions at the tech show. “The forum will be truly open for the first time this year,” said Deputy Prime Minister of Russia and head of the organizing committee of the forum, Arkady Dvorkovich. “All visitors will be able to visit the exhibition without special accreditations, by simply buying a ticket. The event will be a highlight of life in Moscow in October and will be the platform for dialogue between all those involved in innovation in various industries – from computer games to serious medical developments and robotics,” said Dvorkovich. Follow Open Innovations 2015 in Facebook and Twitter.